We’re going to take this week and next to talk about two different —and very important —models for marriage. This week we’ll focus on the DIVISION and STRIFE model and next week on the UNITY and OVERCOMING model. At the outset let me (Steve) say Cindy and I KNOW that all marriages at different times will have division and strife. But is that what you model consistently to those who observe your marriage that God holds us accountable for. Since we began the Marriage Missions ministry in 2001 we’ve received multiple thousands of comments and questions from all over the world. Sadly, the majority of them would fall into the Division and Strife model for marriage. We think it’s safe to say that since you started reading this Marriage Insight you’ve already mentally put your marriage in one of these categories. If you’re not sure, below are a few clarifying questions. When you experience conflict does it result in one or both of you raising your voice to try and get YOUR point across? Have you found healthy ways to resolve your fights? Or is it more common that one or both of you will walk away frustrated and angry? 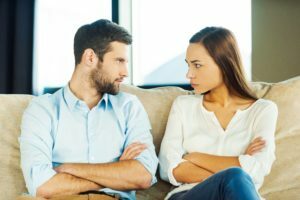 When you do get into fights is the “D-word” (divorce) thrown around as a threat? It’s pretty obvious that when “strife happens,” division most likely occurs. That is because there is nothing about conflict that naturally brings us closer together or creates feelings of love. This is when it’s MOST IMPORTANT to realize that the above actions come from the pit off hell. The enemy of our faith uses these as tools to tear apart Christian marriages. And so often we let this happen. If you are in the middle of a major “blow-up” in your marriage, take the next 7 days and call a TRUCE. No more attacks or yelling for 7 days. Next week Cindy and I will share some points to help you on this issue. The goal is to align yourself to build your marriage to more closely reflect the UNITY and OVERCOMING model. In the meantime, if you’re motivated to start working on it between now and next week’s Marriage Insight look around the Marriage Missions web site. Look for articles and resources that can help you make significant changes NOW. We suggest you also read these verses together and meditate on what God is trying to say. Read: James 5:16, Proverbs 15:1, Psalm 32:8, Proverbs 10:19, and Psalm 34:14.